by Bill Dwight on Tuesday, August 28, 2012 at 5:21 PM | LEAVE A COMMENT! 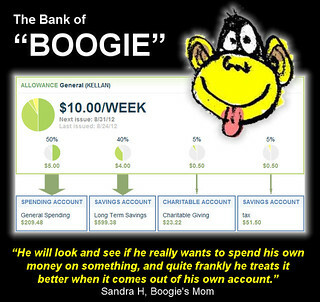 For the last two years, a mom named Sandra H. has been using FamZoo with her son, Kellan — aka “Boogie.” (And, no I didn’t ask about the origin of that nickname!) Sandra’s been pleased with FamZoo, so she decided to tell her good friend K., a fellow parent, how it works in an email. This software doesn’t make you go in every day... There are times I don’t go into the software for weeks at a time, but it is up to date as soon as I log in. It is a great tool to show them how to NOT throw away money. He will look and see if he really wants to spend his own money on something, and quite frankly he treats it better when it comes out of his own account. I really love it. Of course, I still buy things for Kellan but when he wants something just because he wants it, it is interesting to see just how much he truly wants it and whether he will spend HIS money getting it. No “I didn’t ....yes you did....blah blah blah.” It is all right here. For a while, I was splitting the fee with him, but then I showed him I would pay for it as a gift. But the gift is actually for me. This thing is awesome. there are things that became ‘problematic’ in our household (leaving clothes in front of the shower door) and as soon as i checked it two times in two days and kellan ‘saw’ the red color subtract money out of his account, amazingly enough, he quit throwing his clothes on the floor. we have ‘agreed upon penalties’ in the defaults. this software doesn’t make you go in every day, just on the days you want to add or subtract an amount....click the box and it applies it...in red...for all to see. that’s the best part. you set up the defaults and if you need to check to add, check it. or if you need to check as a penalty, it will do that too. there are times i don’t go into the software for weeks at a time, but it is up to date as soon as i log in. the shower thing made me check in each day but it solved the problem in 48 hours too, so that was well worth it. 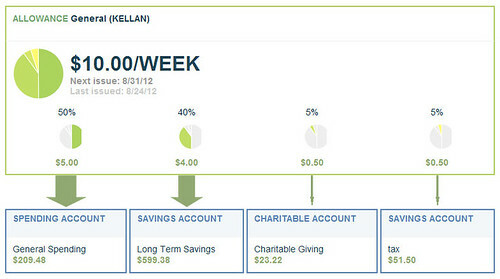 kellan bought minecraft yesterday, so we went in and added it as a debit to his general spending account. and he is okay with that. the number to the right is the new balance in that account. it has a pretty big impact. he will look and see if he really wants to spend his own money on something and quite frankly he treats it better when it comes out of his own account. and you can see these in pie charts, bar graphs, historical charts or a number of ways. the key is....i don’t carry cash. handing boogie cash does NOTHING to show him fiscal responsibility. zip. also....it’s “uh, did i get my allowance....” or “no, you just bought a lego last week”....no “i didn’t ....yes you did....blah blah blah”....it is all right here. for a while i was splitting the fee with him (5.99 a month SEE BETTER OPTIONS HERE) but then i showed him i would pay for it...as a gift...but the gift is actually for me....this thing is awesome. it doesn’t put actual MONEY in the account, it puts the accounting into practice. 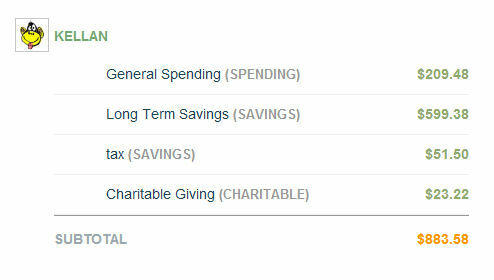 so as long as i currently have $883.58 (according to the chart above) in an account somewhere, then i am good. and heck...not picking up clothes in front of the shower alone is worth it!!!!! haha. talk to you soon. Sandra, you tell the FamZoo story better than I ever could! Thank you for being such a fabulous FamZoo ambassador, and, more importantly, thank you for using FamZoo with your family.